How many people were killed in the Dresden air raid? The number of German civilians killed in the Allied air raid on Dresden was at least 135,000 and possibly as high as 250,000. In 1991, for example, Holocaust denier David Irving claimed that only 25,000 people were killed at Auschwitz, but that “. . . we killed five times that number in Dresden in one night.” As Irving’s argument goes, if the Allies committed such a massive atrocity at Dresden, then the importance of Auschwitz-Birkenau as a symbol of Nazi war crimes has been overblown. Official reports show that between 25,000 and 35,000 people were killed during the Dresden air raid. Despite these official reports, Irving inflates the death toll in order to, by comparison, diminish the role of Auschwitz-Birkenau in the Holocaust as well as the number of Jews murdered throughout the war. What has David Irving claimed about Dresden? Irving and other Holocaust deniers emphasize the Dresden air raid in order to compare the air raid to the atrocities at Auschwitz-Birkenau. Deniers inflate the number killed during the air raid and deflate the number of Jews murdered at Auschwitz-Birkenau. For instance, during a television interview in November 1991, Irving claimed that 25,000 people were killed at Auschwitz-Birkenau, but that “. . . we killed five times that number in Dresden in one night.” Holocaust deniers ultimately contend—through their false figures for both—that the Allied air raid on Dresden was a far worse war crime. The correct death toll—which is terrible enough—is between 25,000 and 35,000. This number is based on the Germans’ own historical records regarding the number of bodies recovered, cremated, or buried. For proof of his inflated figures, Irving uses a forged document, entitled “TB-47” (Tagesbefehl 47, or Order of the Day No. 47), which he unearthed in unusual circumstances in 1963. Irving ascribed the authorship of this document to one Dr. Funfack, whom Irving described as the Deputy Chief Medical Officer for Dresden. In fact, Dr. Funfack was an urologist and was only a bystander with no inside knowledge. Before publishing “TB-47,” Irving failed to contact Dr. Funfack and confirm Dr. Funfack’s alleged authorship of the document. Rather, Dr. Funfack repeatedly tried to convince Irving to retract his claim that Dr. Funfack authored “TB-47,” but to no avail. In 1965, Irving’s “TB-47” was shown to be a clumsy forgery after the real “TB-47” turned up. Irving was informed about the existence of the real “TB-47” on April 5, 1966. After more than a decade, the authentic “TB-47” was finally published (1977), proving once and for all that Irving’s version was a mere forgery. Irving has never repudiated the forged “TB-47” and has continued to publish it in the appendix of his book Apocalypse 1945. What does the forged “TB-47” say and how does it compare to the real “TB-47”? The forged “TB-47” states that 202,040 people were killed in the Dresden air raid, with a possible death toll of 250,000. It also states that 68,650 bodies were burned in the Altmarkt (city square). However, when the authentic “TB-47” turned up in 1965, it showed that only 20,204 people were killed with perhaps as many as 25,000. The number of bodies burned in the Altmarkt was listed as 6,865. Someone, possibly in the Ministry of Propaganda, clumsily added a zero to the figures, inflating them 10 times over (20,204 became 202,040; 25,000 became 250,000; 6,865 became 68,650). The intention was clearly to inflame the German public. After finding the forged “TB-47,” Irving immediately began to publicize the exaggerated numbers for political impact. For example, in a letter to the Provost of Coventry, UK, Irving suggested that the city should have an exhibition of the Dresden air raid bombings, with the forged “TB-47” placed alongside them. He said that the “TB-47” document should be reproduced “in large type” in order to “drive home the impact of the exhibition,” largely because “its nonchalance and the casualties it mentions have a shattering effect.” Why Coventry, England? 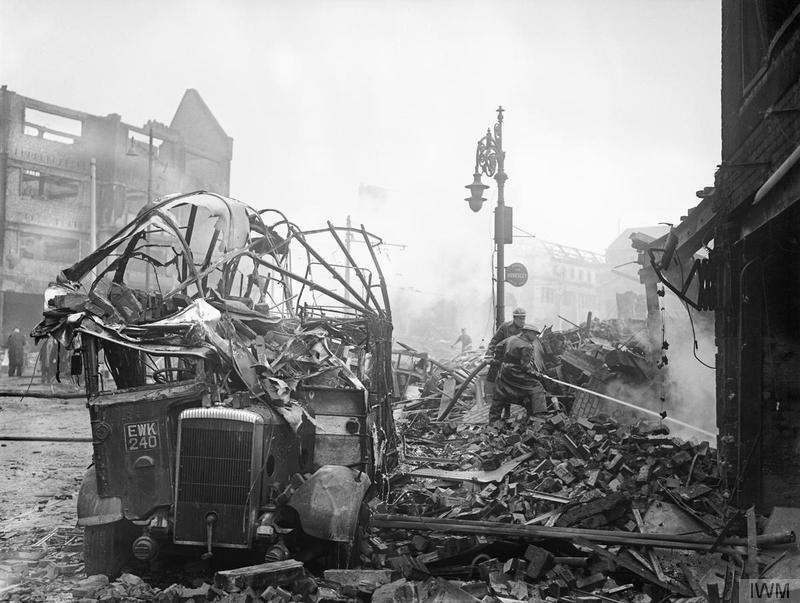 The city of Coventry had been nearly destroyed in a Nazi air raid on November 14, 1940. The result was a large loss of life and property. Irving intended to diminish the bombing of Coventry by comparing it to his inflated figures for the Dresden bombing. Ruins in Dresden. By War Office official photographer, Taylor (Mr) [Public domain], via Wikimedia Commons. Irving knowingly promotes the forged “TB-47” so he can exaggerate the death toll in Dresden by a factor of 10. He wants to falsely compare the inflated death toll in Dresden to his own minimal assessment of the death toll at Auschwitz-Birkenau. As shown, legitimate historical research almost universally places the Dresden air raid death toll between 25,000 and 35,000. Richard J. Evans, David Irving, Hitler and Holocaust Denial, Section (5)(5.2)(d)(i) at www.hdot.org. See also David Irving, “Life Under Fire” (“The Right to Be Wrong”) at http://www.ihr.org/jhr/v13/v13n1p-8_Irving.html. Videotape of speech, David Irving, The Search for Truth in History—Banned! 1993 in “David Irving: A Political Self-Portrait” “David Irving: A Political Self-Portrait: Electronic Edition.” (“1.2 Holocaust ‘myth’ as Jewish extortion, 1.2/L”). Richard J. Evans, David Irving, Hitler and Holocaust Denial, Section (5)(5.2)(d)(i). This Week, 28 November 1991 at Judge Charles Gray, Holocaust Denial on Trial, Trial Judgment (“XI. Justification: The bombing of Dresden, The Defendants’ criticisms of Irving’s account of the bombing, 11.7”) at www.hdot.org. Richard J. Evans, David Irving, Hitler and Holocaust Denial, Section (5.2)(d)(iii)(A)(5-11). Richard J. Evans, David Irving, Hitler and Holocaust Denial, Section (5.2)(d)(iv). Richard J. Evans, David Irving, Hitler and Holocaust Denial, Section (5.2)(d)(v)(2). Richard J. Evans, Lying About Hitler: History, Holocaust, and the David Irving Trial (Basic Books, 2002), p. 154. Earl A. Beck, Under the Bombs: The German Home Front 1942-1945 (University of Kentucky Press, 1986), p. 179. Friedrich Reichert, “Verbrannt bis zur Unkenntlichkeit,” in Dresden City Museum (ed). Verbrannt bis zur Unkenntlichkeit. Die Zerstörung Dresdens 1945 (Altenburg, 1994), pp. 40-62, 58 as cited in Richard J. Evans, David Irving, Hitler and Holocaust Denial, Section (5.2)(d)(i).